We have thought highly of our current team of three-year-olds for some time and it was great to see one of them, the promising Daniela Rosa, successfully take on the boys at Sandown on Wednesday. Having only her third start - and facing a considerable rise in class off a Cranbourne maiden victory against her own gender, the daughter of Dane Shadow travelled well on pace for Jake Noonan - looking the winner a fair way out. Saluting by 3/4 length with plenty in hand, Daniela Rosa has pulled up well and, with Michael Moroney confident that she is stakes class, he is playing around with the idea of running her in the Kewney Stakes at her next outing. Always a fan of the bay, Moroney said that she is a "filly with gate speed which is a big plus, she makes her own luck." Speaking of our nice three-year-olds, we have three of them heading to Flemington on Saturday, kicking off with Alaskan Rose who is second up in the Gr.3 Vanity Stakes. "We really feel that she has improved," Moroney said, adding that the daughter of Encosta de Lago is a more mature horse than she was in the spring - "she is relaxed and eating well and all the signs are good for a successful campaign - and the 1400m at Flemington will really suit." Two of our classiest three-year-old males line up in the Gr.3 C.S Hayes Stakes; Tulsa (pictured) and Tivaci. Unfortunately neither have fared well in barrier draw, due to jump next to each other out in gates 12 and 11. "Tulsa was good after facing the breeze out wide first up," said Moroney, adding that it has always been hard to get a gauge on the Sebring gelding at home - "he has never been a flash worker but he does seem to have come on from his last run." High Chaparral colt Tivaci is also second up having impressed with a first up victory at Pakenham a couple of weeks ago. And he too has improved. "He looks like he is finally turning the corner," Moroney said, noting that the bay was green when last in work. "He has always had the ability and whilst he is still not 100% he has improved his manners a lot since the spring." Also racing at HQ on Saturday is the talented Yesterday's Songs who is second up in the Hong Kong Jockey Club Trophy with Damien Oliver aboard. 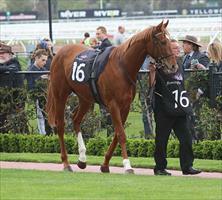 "He was very fresh when resuming, he was very hot and on his toes in the mounting yard which surprised us a bit. The 1000m didn't really suited but he has been improved by the run and is better suited up to the 1200m." We have a busy day at Tatura on Monday also; three runners, the first of whom is Burhan who was unplaced but not disgraced over 1430m when resuming at Geelong late last month. Being a son of Zabeel he is much better suited over the 1980m of Monday's contest and we are looking for an improved showing with the blinkers added. "He is probably still a preparation away but he is a nice staying type in the making and it would be no surprise to see him quickly clear his maiden." Same goes, Moroney says, for Moqwao in the following race, a 1600m maiden. Solid at his 1430m debut at Geelong, he has progressed nicely since and whilst he too will be better later on, he looks a good chance at maiden level. Rising Stock is the third of our Tatura trio and we are hoping he can make it two in a row after proving too strong for his rivals at the same track a few weeks ago. A couple of gear changes including the addition of a one-eyed blinker are in place for the Tavistock four-year-old who still does a fair bit wrong in his races. "Changing gear after a win is not something we do very often," Moroney admitted, "though we did that with Daniela Rosa on Wednesday which proved successful. Jake (Noonan) said his fellow just wanted to get out onto the wrong leg last time and as he rises through the classes he is less likely to get away with that sort of thing. But this is a nice race for him and he looks a pretty good chance for the double."